Levantine cuisine – and in particular Palestinian cuisine – has a long-standing and rich gastronomic tradition. Some of the region's delicious dishes are famous around the world, while others are still unknown. Kibbe (a combination of bulghur and meat), musakhan (bread topped with sumac, onions, pepper, and sometimes roasted chicken), and maqluba (an “upside-down” dish of fried vegetables, meat, and rice) … dishes that are part of the world's culinary heritage. Nablus is a city in Palestine located in the northern West Bank, approximately 40 miles north of Jerusalem. Nablus’ population suffers from economic difficulties with high rates of unemployment and poverty. In this context, women live in unenviable conditions, affected not only by economic constraints but also lacking places to meet and socialize. Bait al Karama, one of Rising Voices micrograntees of 2012, is described by its founders (three women hailing from Palestine, Italy, and the UK) as the first female-run cookery school in Palestine. It works with Slow Food International and manages itself as a social enterprise. Last year in June, a workshop was held for 10 women from Nablus. During 4 days, students, workers, and former political prisoners learned the basics of photography and video production. Their subject? Palestinian food heritage, of course. The participants wandered through the city interviewing makers of traditional food, and produced several videos. These videos are part of Bait al Karama's goal to promote Palestinian food internationally, from participation at Slow Food's Terra Madre gathering, to even feeding the European Parliament in March. Much of their work is participatory, teaching cooking clases to locals and tourists, earning them a place in Lonely Planet… As they look for new ways to generate income for the center and constitute a “meeting point for the women of the local community” this also includes catering and now a beauty salon. In the future, they hope to open a restaurant. Upcoming? 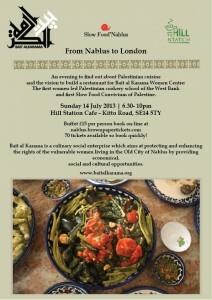 They will be in London on the 14th of July, 2013 to support their vision to open a restaurant – you can join in the support and have a delicious dinner in the process.